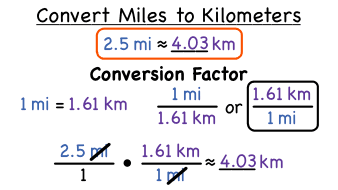 How Do You Convert Miles to Kilometers? The world is full of different units of measure, and it's important to know how to convert from one unit to another. This tutorial shows you how to convert from miles to kilometers. Check it out! Understand a multiple of a/b as a multiple of 1/b, and use this understanding to multiply a fraction by a whole number. Know relative sizes of measurement units within one system of units including km, m, cm; kg, g; lb, oz. ; l, ml; hr, min, sec. Within a single system of measurement, express measurements in a larger unit in terms of a smaller unit. Record measurement equivalents in a two-column table. What are the Metric Units of Length? If you're measuring the length of an object, you can use one of the metric units used to measure length. Follow along with this tutorial to learn about these metric units for length.